Before and immediately after it was clear that Donald Trump had been elected, the markets (especially the stock market) had negative votes on the man (thinking he might be irresponsible), while after he got elected, the markets reacted to the man’s policies—so the correlations reversed. That shift was due to the changing complexion of market participants—those who drove the markets after his election were largely those who kept their powder dry until they saw the outcome and chose to process (and bet on) the policies themselves. As for us, we chose not to bet on whether or not he would be elected and/or whether or not he would be prudent because we didn’t have an edge in predicting these things. We try to improve our odds of being right by knowing when not to bet, which was the case. Having said that, we want to be clear that we think that the man’s policies will have a big impact on the world. Over the last few days, we have seen very early indications of what a Trump presidency might be like via his progress with appointments and initiatives, as well as other feedback that we are getting from various sources, but clearly it is too early to be confident about any assessments. What follows are simply our preliminary impressions from these. We want to make clear that we are distinguishing between a) the sensibility of the ideology (e.g., one leader’s policies might be “conservative/right” while another’s might be “liberal/left”) and b) the capabilities of the people driving these policies. To clarify the distinction, one could have capable people driving conservative/right policies or one can have incapable people driving them, and the same is true for liberal/left policies. To understand where we are likely to be headed, we need to assess both. To be clear, we are more non-ideological and practical/mechanical because to us economies and markets work like machines and our job is simply to understand how the levers will be moved and what outcome the moving of them is likely to produce. We won’t go down the litany of particulars about the directiAs far as the ideology part of that assessment goes, we believe that we will have a profound president-led ideological shift that is of a magnitude, and in more ways than one, analogous to Ronald Reagan’s shift to the right. Of course, all analogies are also different, so I should be clearer. Donald Trump is moving forcefully to policies that put the stimulation of traditional domestic manufacturing above all else, that are far more pro-business, that are much more protectionist, etc.ons, as they’re well known, discussed in my last Observations, and well conveyed in the recent big market moves. As a result, whereas the previous period was characterized by 1) increasing globalization, free trade, and global connectedness, 2) relatively innocuous fiscal policies, and 3) sluggish domestic growth, low inflation, and falling bond yields, the new period is more likely to be characterized by 1) decreasing globalization, free trade, and global connectedness, 2) aggressively stimulative fiscal policies, and 3) increased US growth, higher inflation, and rising bond yields. Of course, there will be other big shifts as well, such as pertaining to business profitability, environmental protection, foreign policies/alliances, etc. Once again, we won’t go into the whole litany of them, as they’re well known. However, the main point we’re trying to convey is that there is a good chance that we are at one of those major reversals that last a decade (like the 1970-71 shift from the 1960s period of non-inflationary growth to the 1970s decade of stagflation, or the 1980s shift to disinflationary strong growth). To be clear, we are not saying that the future will be like any of these mentioned prior periods; we are just saying that there’s a good chance that the economy/market will shift from what we have gotten used to and what we will experience over the next many years will be very different from that. To give you a sense of this, the table below shows that a) these economic environments tend to go on for about a decade or so before reversing, b) market moves reflect these environments, and c) extended periods of movements in one direction (which lead to confidence and complacency) tend to lead to big moves in the opposite direction. As for the effects of this particular ideological/environmental shift, we think that there’s a significant likelihood that we have made the 30-year top in bond prices. We probably have made both the secular low in inflation and the secular low in bond yields relative to inflation. When reversals of major moves (like a 30-year bull market) happen, there are many market participants who have skewed their positions (often not knowingly) to be stung and shaken out of them by the move, making the move self-reinforcing until they are shaken out. For example, in this case, many investors have reached for yield with the upward price moves as winds to their backs, many have dynamically hedged the changes in their duration, etc. They all are being hurt and will become weaker holders or sellers. Because the effective durations of bonds have lengthened, price movements will be big. Also, it’s likely that the Fed (and possibly other central banks) will increasingly tighten and that fiscal and monetary policy will come into conflict down the road. Relatively stronger US growth and relative tightening of US policy versus the rest of world is dollar-bullish. 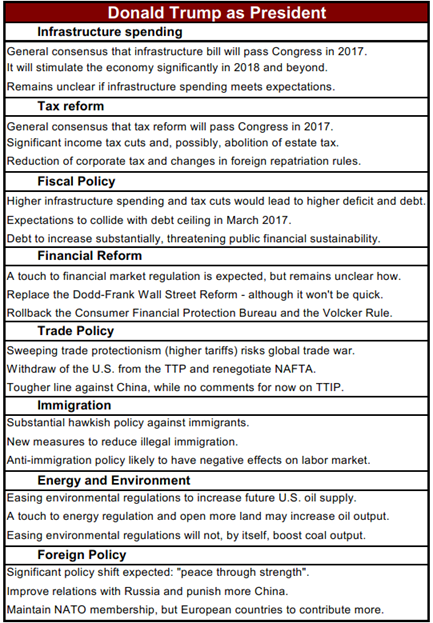 All this, plus fiscal stimulus that will translate to additional economic growth, corporate tax changes, and less regulation will on the margin be good for profitability and stocks, though for domestically oriented stocks more than multinationals, etc. The question will be when will this move short-circuit itself—i.e., when will the rise in nominal (and, more importantly, real) bond yields and risk premiums start hurting other asset prices. That will depend on a number of things, most importantly how the rise in inflation and growth will be accommodated, that we don’t want to delve into now as that would take us off track. Our very preliminary assessment is that on the economic front, the developments are broadly positive—the straws in the wind suggest that many of the people under consideration have a sufficient understanding of how the economic machine works to run reasonable calculations on the implications of their shifts so that they probably won’t recklessly and stupidly drive the economy into a ditch. To repeat, that is our very preliminary read of the situation, which is too premature to take to the bank. Of course, we should expect big bumps resulting from big shifts regardless of who is engineering this big ideological shift. So, what are we trying to say? The headline is that the ideological/environmental shifts are clear, their magnitudes will be large, and there’s a good chance that the “craziness” factor will be smaller and play a lesser role in driving outcomes than many had feared. In fact, it is possible that we might have very capable policy makers of the previously mentioned ideological persuasion in control. As always, we will keep you posted of our thinking as it will certainly change as we learn more. but the questions surrounding the much-awaited production deal are hardly binary. Global financial markets continue to reset and adjust expectations following the US elections. The belief that US will lead a growth charge through raising fiscal spending instead of central bank quantitative easing and austerity has triggered a major response from all asset classes with the dollar, stocks, and bond yields all moving higher. A stronger dollar tends to have a negative impact on the commodity sector as a whole. However, expectations for increased infrastructure spending (and not only in China) and an Opec deal on November 30 have so far provided support to both industrial metals and the energy sector. Precious metals have been the biggest loser with the stronger dollar, stocks, and bond yields all helping to reduce the appetite for gold and silver as an alternative, safe-haven investment. ETF holdings have seen their biggest four week reduction since July 2013 and the price of gold has reached levels where the future of the near-one year uptrend has been called into question. There are two issues at play here. The first is known as Galton’s problem, after Sir Francis Galton, the inventor of much of modern statistics. Galton’s problem is that when we treat cases as independent—the British election, Brexit, the U.S. election—they may not actually be independent. There may be links between the cases—think of Brexit’s Nigel Farage showing up at Trump’s rallies—and there could be subtler contagion or mimicry effects in play as information from one case “infects” the other, changing the dynamics of the system as a whole. 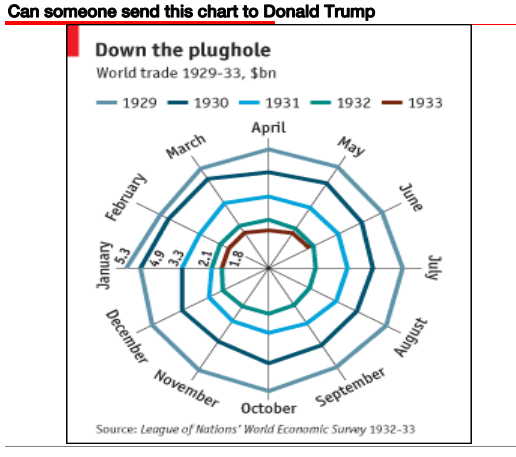 Could there then be a higher set of drivers in the global economy pushing the world in a direction where Trump is really just one part of a more global pattern of events? Consider that there are many Trumpets blowing around the developed world, on both the right and the left. On the one side, insurgent right-wing parties are bulldozing the vote shares of traditional centrist parties all over Europe. For example, the Finns Party is the second-largest party in the Finnish parliament. In Sweden, the Swedish Democrats are the third-largest party in parliament. In Hungary, Prime Minister Viktor Orban’s political party, Fidesz, runs the country having won two elections. Meanwhile in France, the most popular political party is the National Front, which in all scenarios but one—whatever such exercises are actually worth—is expected to win the first round of voting in the 2017 French presidential election. But when all the other parties in France close ranks to prevent the National Front from winning the second round, it’s hardly a victory for democracy. And even in that bulwark of stability, Germany, the upstart Alternative for Germany beat German Chancellor Angela Merkel’s Christian Democratic Union into second place in her own backyard. A clash outside the Labor Ministry in Athens, Greece, January 2013. But there is also a left-wing version of this phenomenon. Consider the Scottish National Party (the clue is in the name), which has annihilated every other political party in Scotland, or Podemos in Spain, which has won 69 out of 350 seats in the Spanish parliament. Left-wing upstart Syriza runs Greece—even if it’s under Troika tutelage—and Die Linke in Germany is yet another drain on the vote share of the once-dominant Social Democrats, whose own vote share has utterly collapsed. These parties of course have very different policy stances. The new right favors nationals over immigrants and has, at best, a rather casual relationship with the liberal understanding of human rights. The new left, in contrast, favors redistribution from top to bottom and inclusive rather than exclusionary growth policies. But they also have more in common than we think. They are all pro-welfare (for some people, at least), anti-globalization, and most interestingly, pro-state, and although they say it sotto voce on the right, anti-finance. To see why, consider our second issue. At the end of World War II, the United States and its allies decided that sustained mass unemployment was an existential threat to capitalism and had to be avoided at all costs. In response, governments everywhere targeted full employment as the master policy variable—trying to get to, and sustain, an unemployment rate of roughly four percent. The problem with doing so, over time, is that targeting any variable long enough undermines the value of the variable itself—a phenomenon known as Goodhart’s law. Long before Goodhart, an economist named Michal Kalecki had already worked this out. Back in 1943, he argued that once you target and sustain full employment over time, it basically becomes costless for labor to move from job to job. Wages in such a world will have to continually rise to hold onto labor, and the only way business can accommodate that is to push up prices. This mechanism, cost-push inflation, where wages and prices chase each other up, emerged in the 1970s and coincided with the end of the Bretton Woods regime and the subsequent oil shocks to produce high inflation in the rich countries of the West in the 1970s. In short, the system undermined itself, as both Goodhart and Kalecki predicted. As countries tried harder and harder to target full employment, the more inflation shot up while profits fell. The 1970s became a kind of “debtor’s paradise.” As inflation rose, debts fell in real terms, and labor’s share of national income rose to an all-time high, while corporate profits remained lowand were pummeled by inflation. Unions were powerful and inequality plummeted. The era of neoliberalism is over. The era of neonationalism has just begun.